Hosting a brunch is one of my favorite ways to entertain a group of friends. Delicious, yes, but it's also a low-key and really inexpensive way to feed a crowd as you can get away with serving little more than eggs, bread, and fruit. Assure endless glasses of mimosa by squeezing a pitcher of fresh orange juice (or just buying a carton with "lots of pulp") and asking your friends to each pitch in with a bottle of their favorite sparkly beverage (skip the pricey champagne in favor of affordable and equally-delicious prosecco). 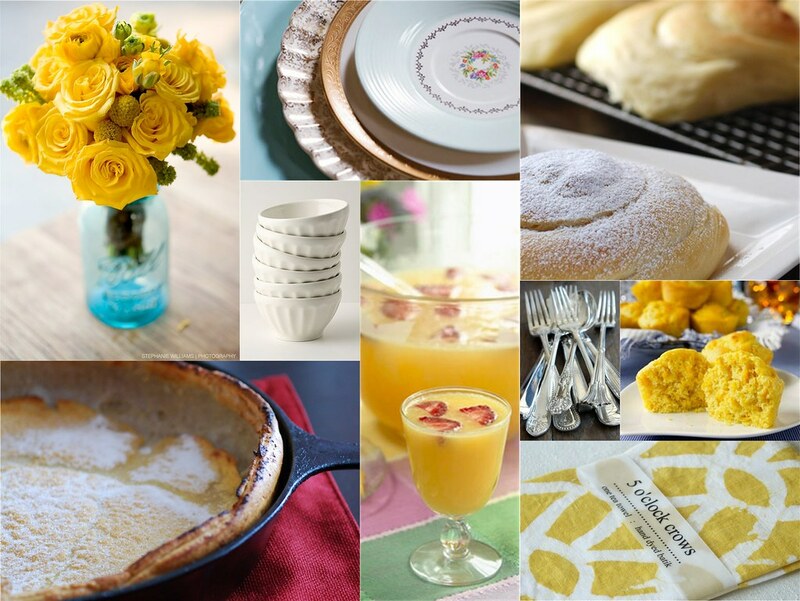 For the menu, think bakery-warm sweet rolls, fresh corn muffins, maple-sweetened butter, a bowl of in-season fruit, and a sugar-dusted Dutch baby pancake still sizzling in the skillet. Stick bunches of grocery store flowers (pretty and cheap!) in whatever jars you have laying around and set each place with a summer-bright tea towel as a double-duty placemat/napkin. Fill big heavy latte bowls to the brim, and settle in for a few lazy hours. If you'd like to make a day of it, plan an equally lazy post-lunch activity (perhaps a walk across the street to the neighbor's garage sale or a few old movies to watch) and leave the leftover baked goods out on the table for a bit of grazing later on in the afternoon.